There are good surprises, and there are bad surprises. While we're generally a fan of the unexpected, there is one place where we draw the line—our food. Though we like to eat adventurously, we don't like to find anything in our food that doesn't belong there. So, when we heard the recent story about a woman who found sperm swimming in her yogurt, we took it upon ourselves to investigate this truly terrifying trend. Turns out, that-white-stuff isn't the worst thing that could end up in your mouth (ay-yo!). We prowled the web and found over two dozen indigestion-inducing ingredients that unexpectedly ended up on people's plates to bring you this far-from-delectable collection of cuisine. 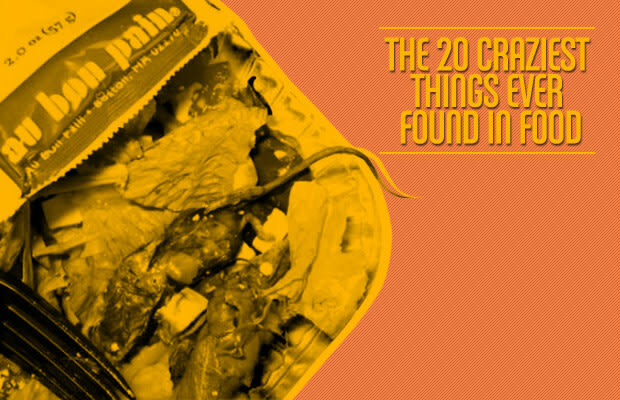 Get ready to lose your lunch— here are the 20 Craziest Things Found in Food.